Trousselot Park is a busy little playground on the banks of the Kaiapoi River. It’s all pretty new and modern – the highlight for us was the mouse wheel! There’s a skate area that caters for a range of ages, a basketball half-court, and a playground. The playground equipment is mostly suited to younger children (only has baby swings and small slides) but there’s a more challenging rope climbing frame too. 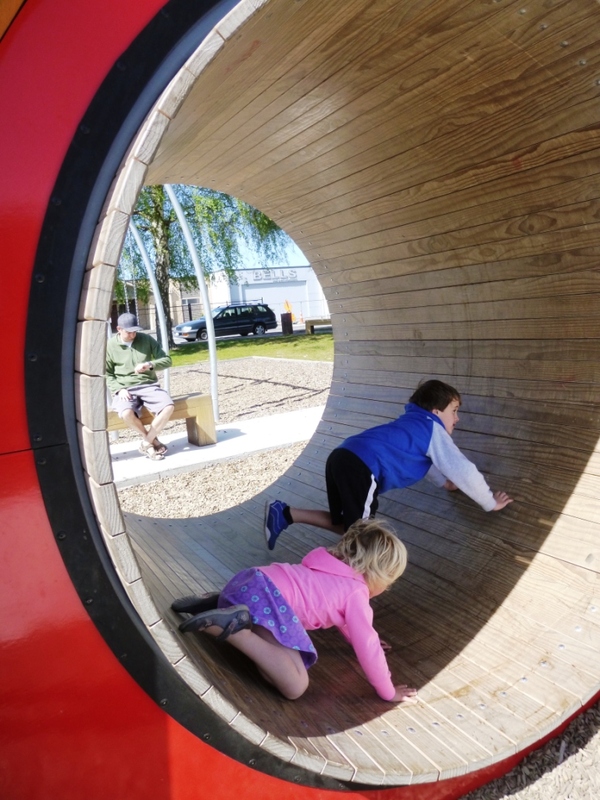 The layout of the playground is cleverly designed and includes plenty of wooden seating, a rock area, and low wooden “fence”, which all give further non-conventional options for imaginative play. Our kids opted for some hill rolling too! See below for location. The surrounding areas are very well kept (grassy areas, Band Rotunda, rose garden, war memorial). Use the nearby suspension bridge to cross the river and walk the short loop back across the Williams Street bridge. You’ll pass the Kaiapoi War Memorial and Coffee Culture. The Kaiapoi Lakes Reserve is also just a short drive north up Williams Street – a great spot to explore. We visited Trousselot Park in October 2015 (spring). There is lots of seating and picnic areas, and a drinking fountain. The toilet block in the playground was still being built when we visited but there are other public toilets nearby in the Kaiapoi Civic Centre (I assume!) and there’s a small block across the river near the war memorial. It’s really central, just turn left into Charles Street, off Williams Street and you should be able to park right beside the playground.